The second in a minotaur themed trilogy, Minotaur’s Betrayal leaves off where Minotaur’s Bargain ended. There is an assumption of satisfactory completion of the first part, which makes sense for a part 2. The module does offer a hook in if Part 1 was not completed, but it works better as a continuation of the story. The PCs are offered Minotaur assistance and return to their town to face the impending orc threat. Along the way they are attacked, though the Minotaur captain is the target. Reaching the town they find it under assault by an orcish band lead by a troll. The force seems a little light on for a full assault, however and once the invasion is repelled the PCs discover it was a diversion for a traitorous rebellion within the Minotaur ranks. Returning to the Minotaur camp they find the honourable leader slain and a usurper in her place. The usurper has given the orcs a powerful item (Banner of Gruumsh) for their support. The PCs must manage the volatile minotaur in order to be best placed to reclaim the tribe. Following on from this the PCs are directed to infiltrate the fairly extensive orc stronghold and retrieve the lost banner, potentially hampered again by the social values of the minotaur. The stronghold has a number of interesting features, including amusing orc graffiti, eclectic prisoners to free, and a theoretically overwhelming contingent of Orcs if the players aren’t careful. The alternate route provided through the encampment is possibly just as dangerous. The Chieftain’s quarters holds the stolen Banner of Gruumsh, and ostensibly the focus of PCs incursion, though there is nothing stopping them from slaying the chief and the priestesses, which would also end the threat from the orc tribe. Minotaur’s Betrayal is a very different beast from its predecessor. Players might want to wear neck braces, such is the sharpness of the turn. It might catch some players by surprise if they were expecting another deathtrap dungeon style outing, and instead find themselves in a story driven tale of plot and logic that the first instalment lacked. Truthfully the adventure is all the better for it. As I indicated in my last review I don’t generally enjoy ‘just because’ trap dungeons, and prefer my adventures to have a plot, NPCs that have depth and motivation and logical details such as “where do they get rid of their waste?”. Not only does Minotaur’s Betrayal cover all of these, it manages to be both concise in language and thorough in minutiae, which is a difficult trick to pull off. The Orcs Stronghold – where the main action takes place – genuinely feels like a tribal home, complete with the kinds of details you’d expect. On a technical level there are a few minor spelling errors, but nothing egregious, and one of the numerous maps didn’t scan well, but retains enough detail to play from (just probably not hand out). On a design level I did find it odd that the orc stronghold has 2 separate waste areas that apparently aren’t connected, but again this is more a matter of preference than any real issue. Yes I’m nit picking here. There’s not a whole lot to criticise about this adventure. The layout is easy to follow, and well defined in terms of information presentation and flow. It is easy to read and run from a DM perspective, and offers adjustment advice for more or less powerful or numerous parties. I have to say that I love this type of plot driven adventure, and Minotaur’s Betrayal is a great example of it. Along with the core crunch and action, there’s enough incidental detail to bring the locations and cultures alive without overpowering the goal of a smooth running, fast paced adventure. JVC Parry and Phil Beckwith have created an excellent and evocative module here that strikes a good balance between monster bash and roleplaying opportunities. I definitely recommend this one, and – assuming you can reconcile the differing styles – it should be played as part of the trilogy as intended. I am really looking forward to the third part. 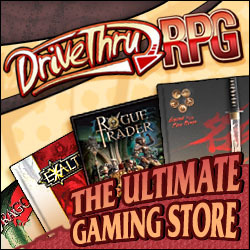 Anyone who has spent any time browsing the DMs Guild over the last 6 months has probably noted the work of Travis Legge – he seems to be putting out mini products at an amazing rate, along with his videos on his Eberron campaign and interviews with DMs Guild creators. He has also embarked on a crusade to review as many products as humanly possible, which is laudable. Today I look at three of his recent mini-products – all PWYW Class Archetypes. All three are short, mostly plain text PDFs, though each has a splash of appropriate to semi-appropriate art to give some visual stimulation. Nothing groundbreaking in design here, but aesthetically pleasing enough and better than many PWYW offerings. This is an archetype for the Blood Hunter class developed by Matt Mercer (of Critical Role). While not an official class this shouldn’t put off DMs as it is arguably balanced in comparison to the official classes and not overpowered (though I’d gauge it to be on the upper end). It is basically the Witcher, if you are a fan of such things. It is a reasonably complex class however, requiring a level of resource management, and probably not recommended for beginners.